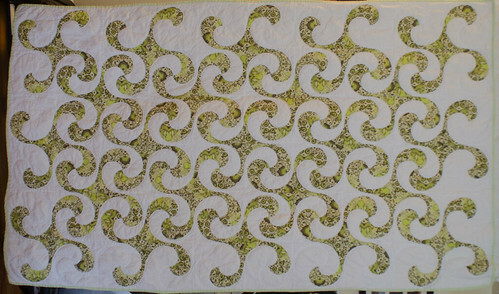 Piecing: the swirls are hand-pieced, NOT appliquéd! 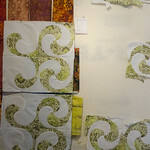 Squares were machine-sewn. 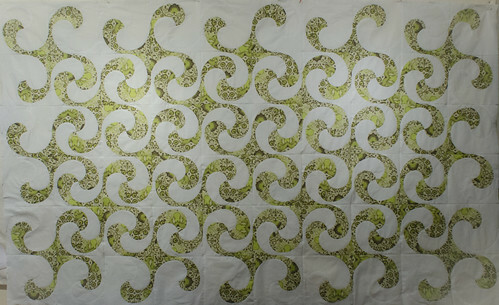 As part of the Bloggers' Quilt Festival, I need to write up a new piece about the quilt I'm entering, so I thought I'd do a single recap about Octopus's Garden, which I completed a few months ago. Because I am batshit crazy that's why! 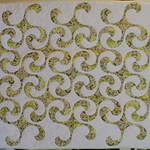 Barbara Brackman: "Mystery Pattern: Swirl"
Barbara Brackman: "More on the Swirl Design"
I can understand why few people have tackled it. Those curves look really, really nasty. 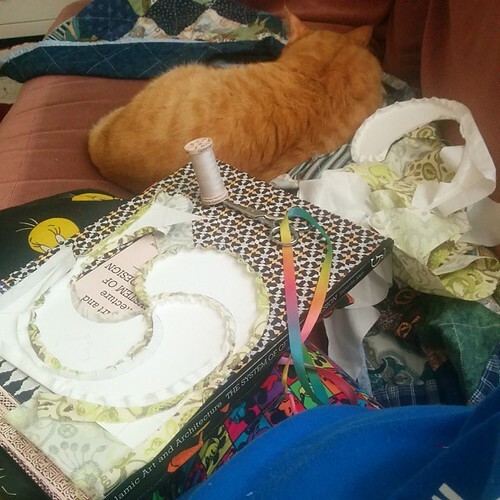 I will admit that a few years ago, I tried to machine-piece the block and created a ragged, miserable failure that was better not discussed or shown to anyone except my cat. I put the template away and muttered, "Someday. 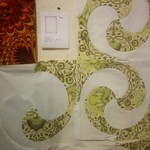 Someday I will PROVE that I can do this pattern." It's doable. My technique was wrong. 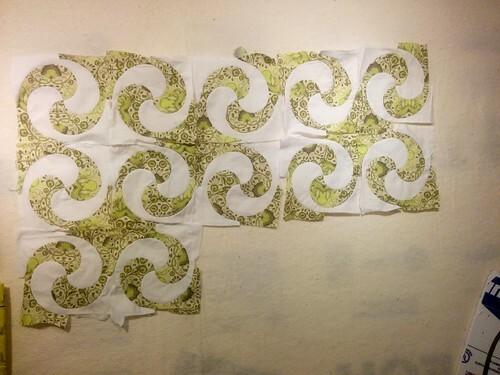 Why this pattern? 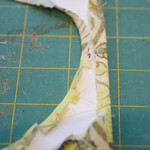 Why this fabric? 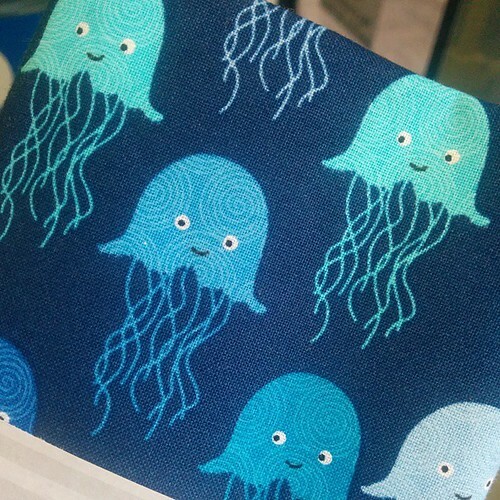 When I learned that a coworker and his wife were expecting their first child, I remembered his love of all things tentacly and pulled out a set of sea-creature fabrics to show him. 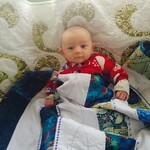 He gravitated to the yellow-green and white fabric a mutual coworker/friend had given me as a gift, part of Tula Pink's Salt Water line. 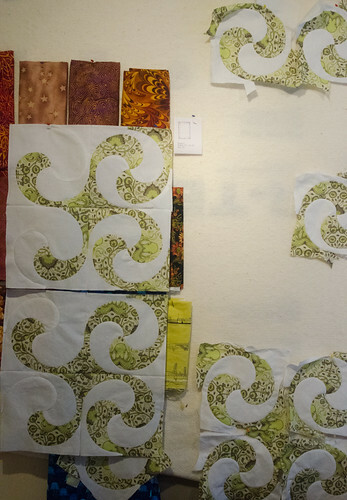 I didn't notice the title of the pattern until much later. 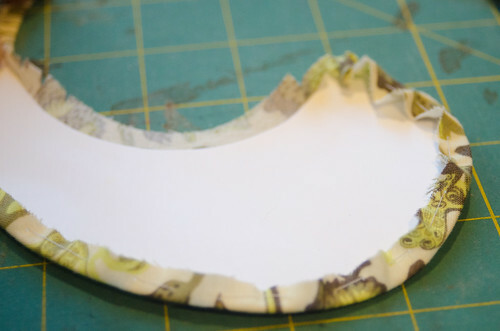 I can't articulate why I went to this pattern piece after having it stored for so long. Maybe it made me think of tentacles. 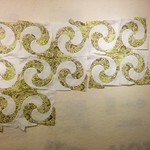 Maybe it made me think of drifting seaweed. Maybe I just wanted a challenge. 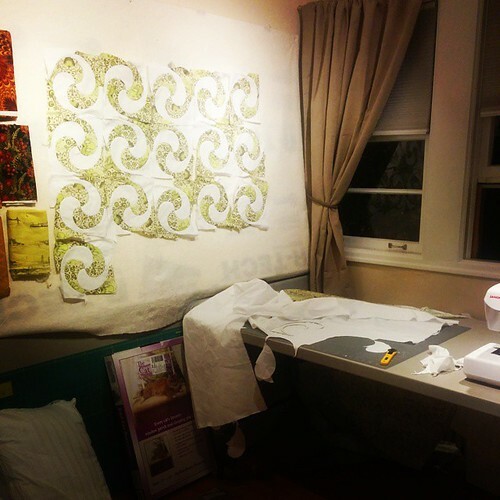 I've been itching to push myself, to challenge my skillset, and I decided it was time. 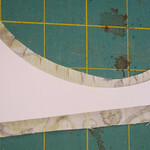 I remembered my disastrous attempt to machine-piece the pattern, and opted to do this one by hand. 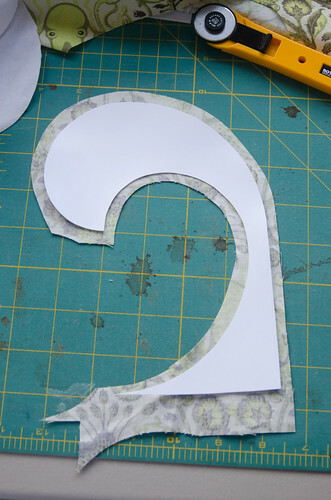 To me, that implied English paper piecing, which I'm very comfortable with after a few projects; it's great for accuracy, but I'd never done it with curves. 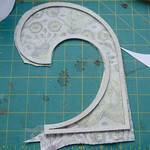 No EPP templates for this pattern exist, so I chose to make my own. 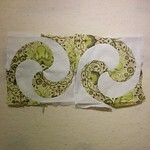 Work on the swirly #quilt continues. Kolohe supervises with his eyes closed. 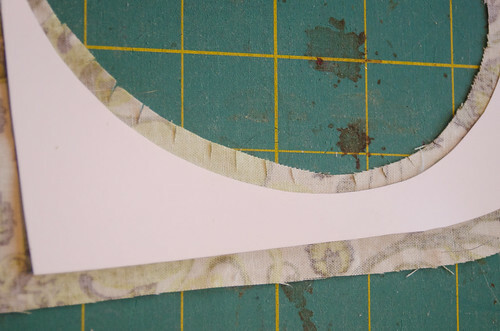 I was very careful with my fabric pressing, removing the basting threads so the seam allowance could flip in either direction, and pressing as much of the seam allowance to the dark side as possible. 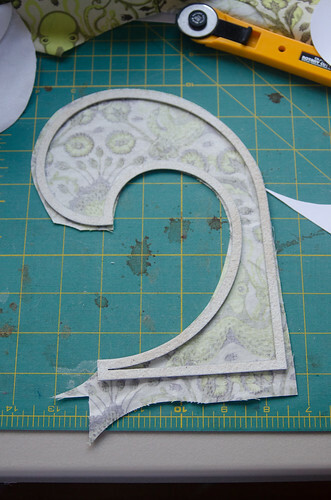 I then took my square ruler and marked the finished size of the square with a pencil, making sure the center of the finished piece was absolutely in the center of the square. 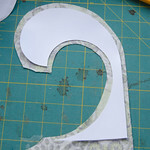 After pressing and marking, I trimmed the seam allowances down to my standard quarter-inch, for assembling on my sewing machine. 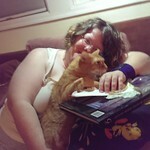 I realized something at this point, though: I needed a dismount. 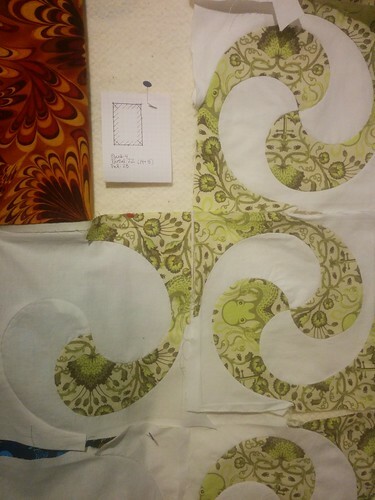 I didn't think I wanted the pattern to cut off at the edge of the quilt, so that meant I needed a set of special squares -- ones that only had one green swirl and three white, to finish off the interior figures without starting another at the edge. 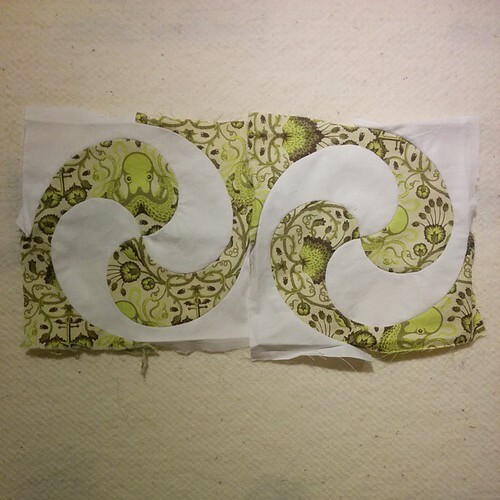 I went back to my Mylar and carefully traced out one more pattern from my template -- one that had the equivalent of two swirls joined together instead of just one. 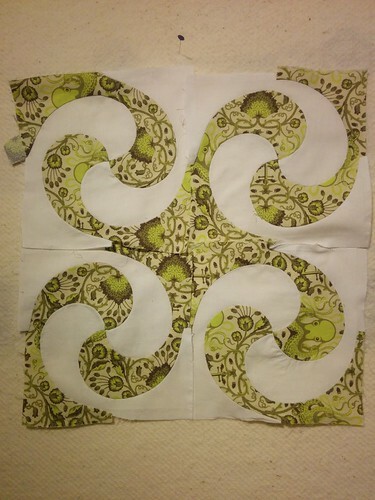 I suspected it would save me a decent amount of labor by removing one curved seam, and I was right; the border pieces took me a little closer to 60 minutes to make instead of the 90 for a four-swirl square. 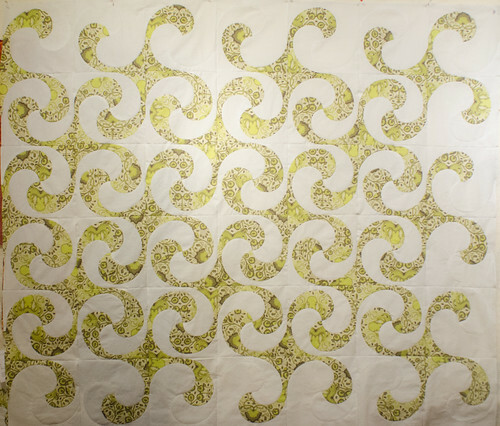 The finished quilt is a 6x10 grid, so 48" x 80". 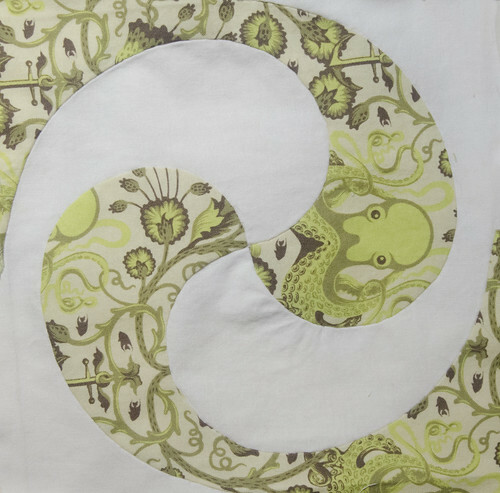 It's a green octopus fabric, made for someone who loves all things octopus and squid. 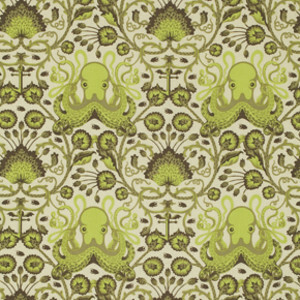 It took about five seconds to name it "Octopus's Garden." 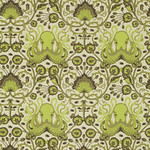 A few weeks later, I looked at the selvage of the fabric and learned, to my amusement, that my source fabric's name was "Octo Garden." Clearly, the theme was there all along, just waiting for me to spot it. 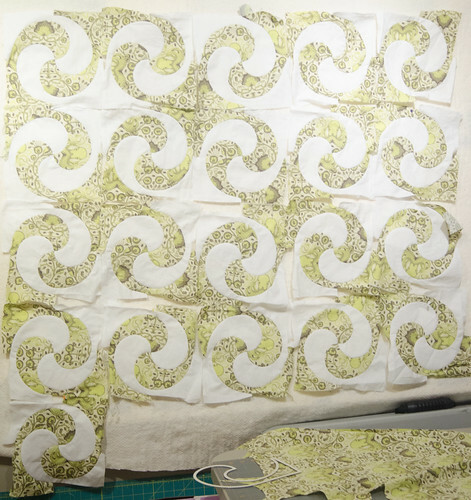 Considering trying this pattern yourself? 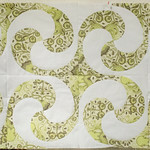 If you're thinking about doing this pattern, I'd encourage you to give it a try before committing to a full quilt top. 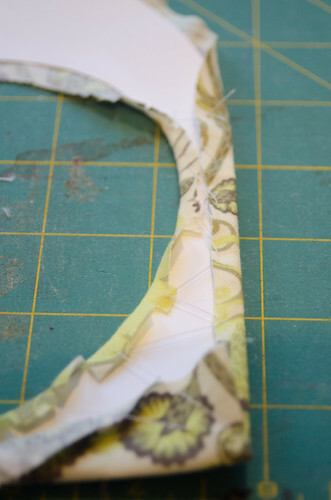 This is not a fast pattern, and this is most emphatically not a pattern that tolerates sloppy work. You will have to pay attention. You will have to use good template material. You will need to go slowly. But going slowly is not hard. Working carefully is not hard. It just means you are careful, considerate, and paying attention. 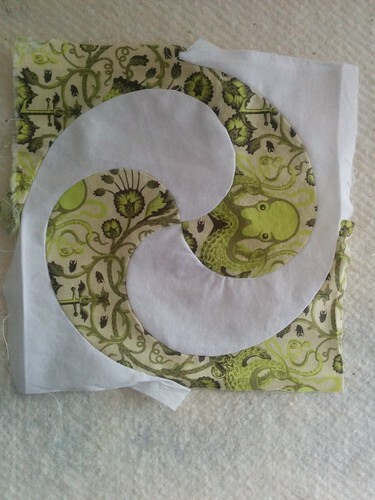 Once you get the hang of the technique, it's actually a surprisingly mindless pattern. It just takes a while. A while. A LONG WHILE. I think the results are worth it, though. 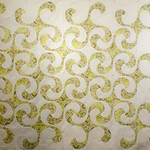 This is not a quilt pattern that is easy to ignore; it stands out. It moves. 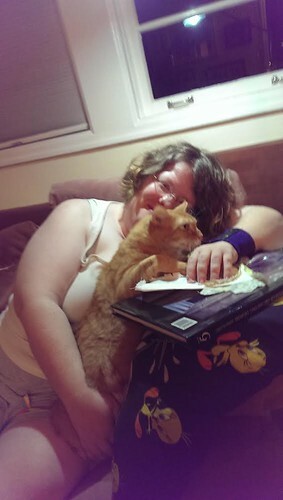 It breathes. 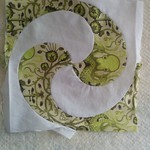 It cries out for bold, simple color choices. 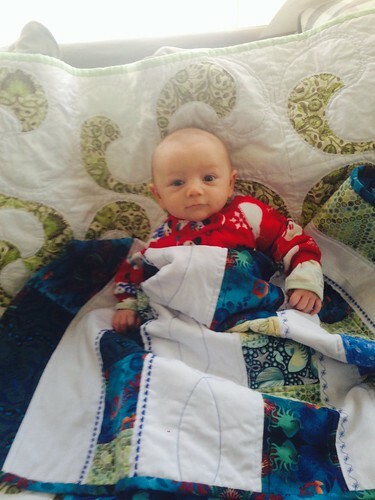 I hope there will eventually be more quilts made with this pattern. Maybe explaining how I did it will encourage someone to try! at Portland, Oregon, United States by domesticat. 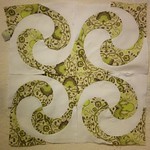 That's two blocks done. by domesticat. 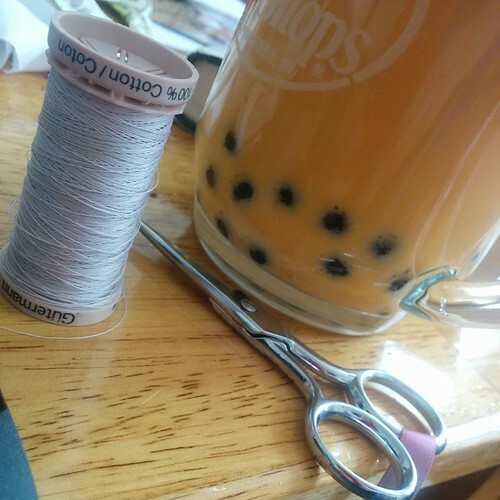 Sunday: more sewing and homemade bubble tea. by domesticat. Back on the wagon. at Portland, Oregon, United States by domesticat. 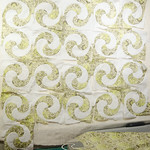 Work on the swirly #quilt continues. Kolohe supervises with his eyes closed. by domesticat. 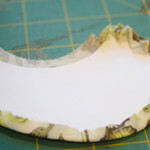 Test sewing success! by domesticat. 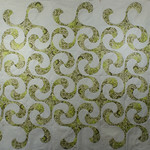 7 of 9 rows complete! by domesticat. 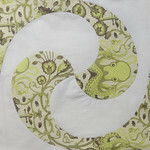 Octopus' Garden: complete!